First let me say that Tulsa is lovely. The river’s edge has been turned into beautiful parks and bike paths, which are then bordered by either quaint neighborhoods or quaint shopping districts. The skyline is attractive if not especially interesting, the city is easy to navigate, and there are several major Interstates running through the city in addition to Route 66. 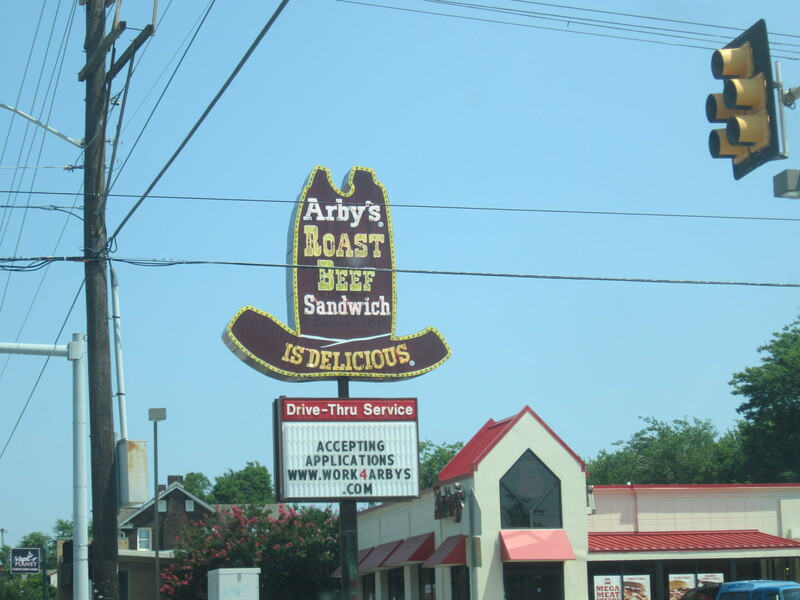 Many of the shops and restaurants have cute names (ex: Purple Glaze Pottery), and all of the many Arby’s restaurants scattered around town still feature the old-old-old-school Arby’s hat neon sign. 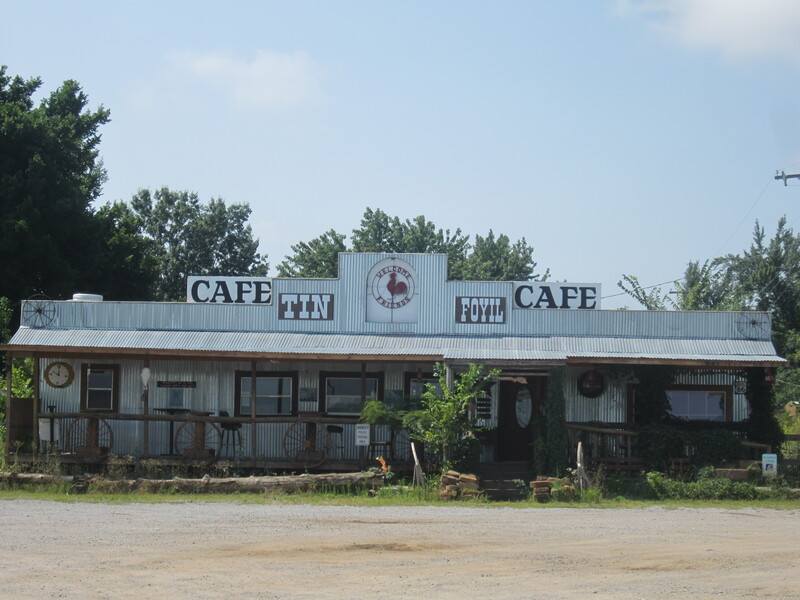 The city calls itself the place where East meets West, meaning that Tulsa is really marks the beginning of cowboy country and is the first time on Route 66 where there’s a palpably different feel to match a palpably different landscape. 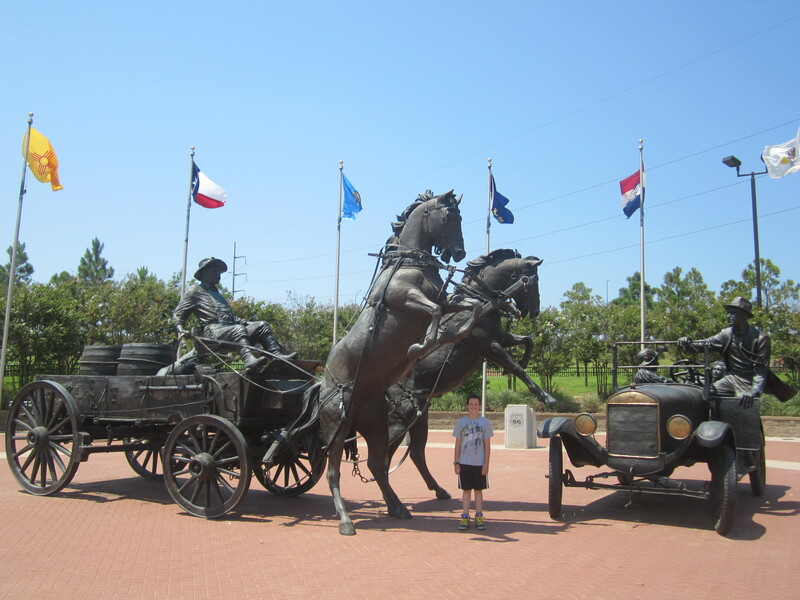 There’s even a cool statue dedicated to this concept, showing a near-collision between a family in a Model T and a cowboy in a horse-drawn wagon. 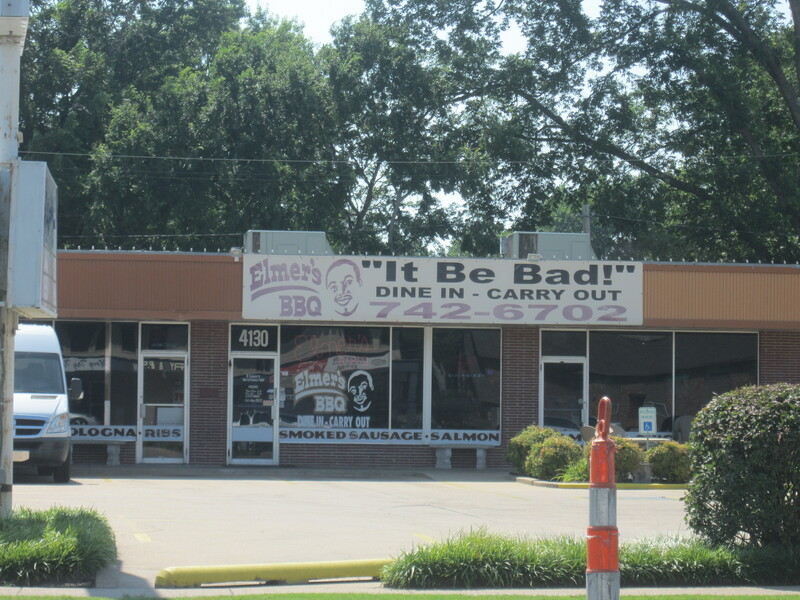 With all that said, there is not a whole lot to do in Tulsa. So today turned out to be more of a seeing day than a doing day. 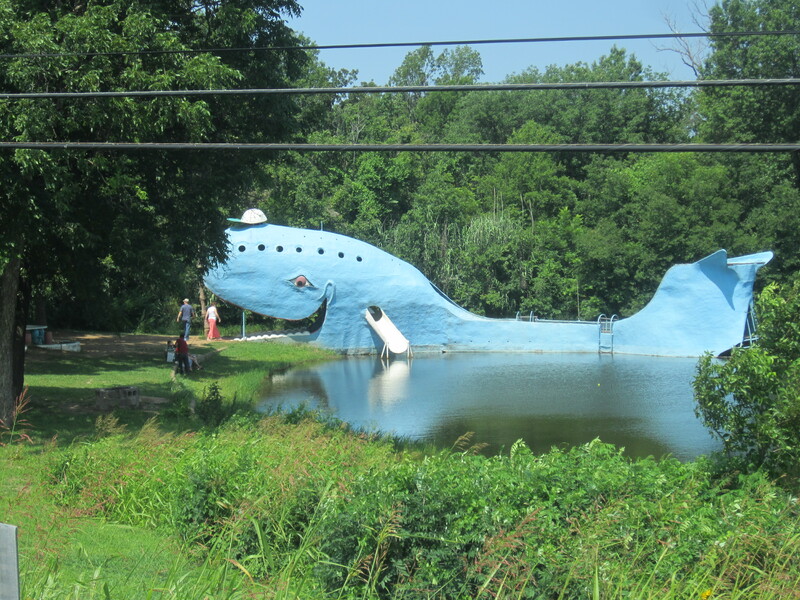 Before we even got to Tulsa, we were bombarded with classic Route 66 roadside nonsense, the first being a totem pole park in Foyil, OK, which features several totems, none of which are of native origin but all of which are colorful and interesting looking. 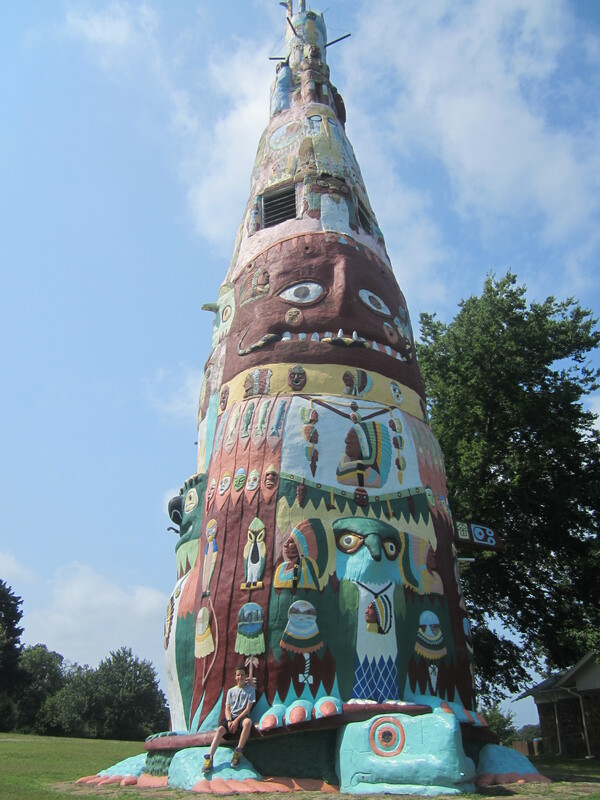 The main draw, though, is the biggest totem pole in America, which stands at 90 feet tall and 18 feet wide. 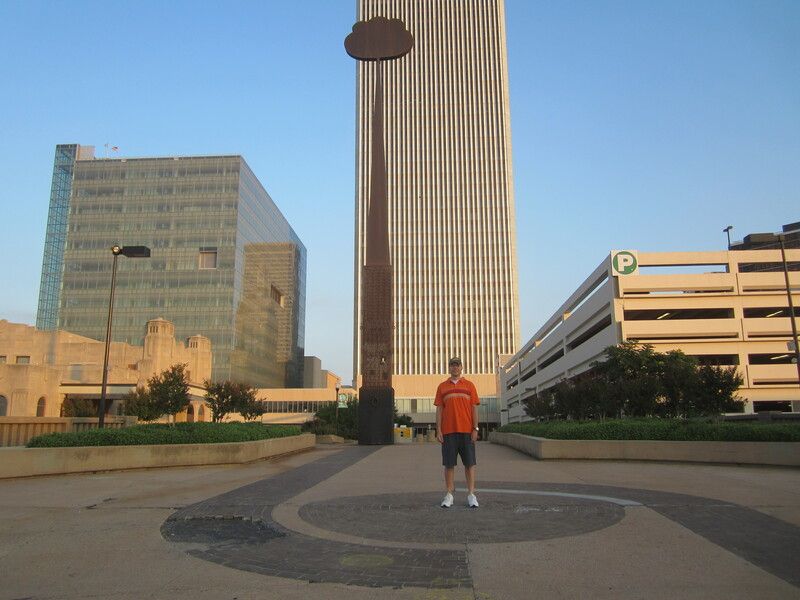 When we got to Tulsa, our first stop was the convention center, not for the RV and boat show being held there but for the enormous golden statue of a worker leaning on an oil well, known locally as the Golden Driller statue. However, with not much of substance on our agenda for the day we decided to stay a while and check out the RV show. For $8 admission, we got an hour of gawking at RVs that are more pimped out than my house—multiple bathrooms, sleeping room for six, 60-inch TVs, outdoor kitchens, and more. I tried to emotionally distance myself so that I wouldn’t get too attached, but I have to admit it was nice to fantasize about driving something that not only has room to spare but also an oven, a full-sized fridge, and even a washer and dryer. The six-figure price tags helped snapped me back to reality, though. However, with the excitement and abandon of a 12-year-old and absolutely zero concern about cost, Sam fell deeply in love with a few models and plans to convince both of his parents that a tricked-out RV is a must-have. 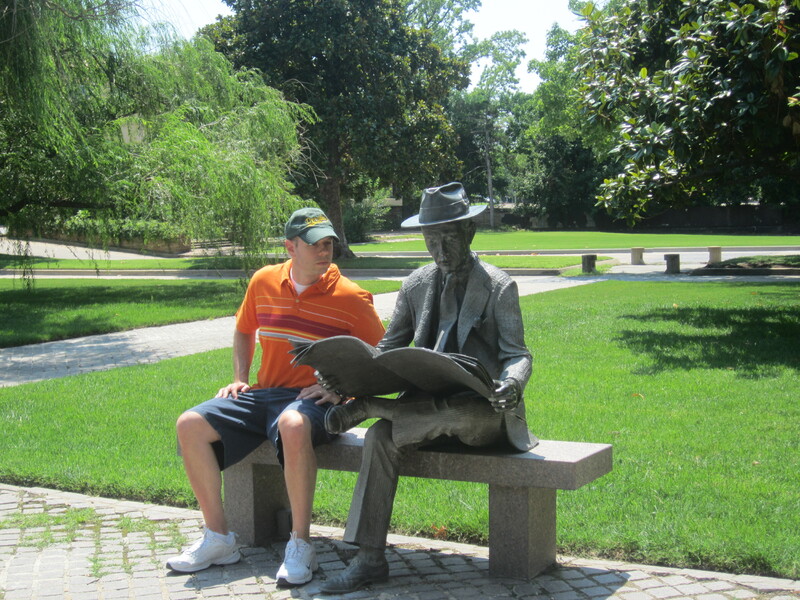 Eventually I dragged him out of the RV show and we continued to visit and pass odd and interesting sights around the city, most notably an extremely detailed statue of former Tulsa businessman Hans Helmerich sitting on a park bench and reading a copy of the Tulsa Daily World newspaper. So THAT’S where he came from and/or where he went! Tulsa is one of the few places on our route between St. Louis and Los Angeles with kosher food is available, so we tried to get our hands on some. It didn’t go so well, though. The only synagogue in town has a little store that carries raw meat, and we tried to go there but accidentally ended up at the Chabad house, which does not sell meat but does have a very friendly and kind rabbi and rebbitzen who recommended the aquarium as something fun to do in Tulsa. We then found the synagogue, which was closed by the time we got there. At that point I took advantage of our abundance of free time and got a car wash, where the girl behind the counter recommended the aquarium as something fun to do in Tulsa. 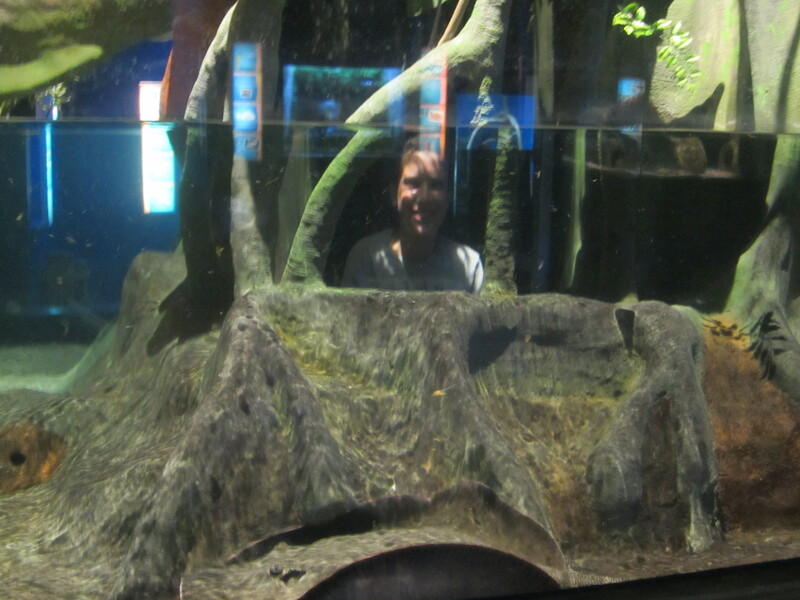 So we gave in and went to the aquarium, which was fun but a little on the small side, and we were in and out within an hour. I would like to take this opportunity to mention how much I absolutely love seahorses. There is simply no more awesome animal on earth. They have the heads of horses but the bodies of deformed mermaids. They swim standing up. They are entirely peaceful. The men get pregnant and have the babies. 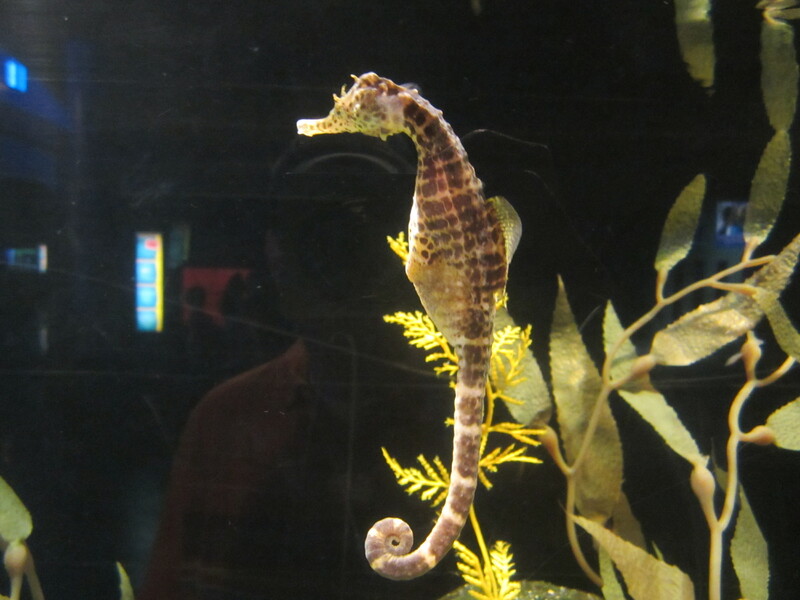 I dare you to name an animal that holds a candle to the seahorse’s coolness. You can’t. Anyway, there are several cute parks scattered all over the city, not even counting the riverside parks, and after stopping at a market to restock on veggies we found a little park and grilled dinner (hot dogs and asparagus). The main attraction of the day was a drive-in movie theater, which was rebuilt a couple of years ago after a big fire and was thus reputed to be rather nice and state-of-the-art. We’d been excited for the drive-in all day but when we finished dinner there was still time to see one more oddity before the movie. The Center of the Universe is clearly misnamed as it is most definitely not central to the universe, either physically or spiritually. It is, however, a freakish acoustic anomaly that was totally worth a visit. Essentially it’s just a brick circle in the middle of a pedestrian overpass in the arts district. But if you stand right in the center of the circle and speak, your voice reverberates in your own ears as if you’re speaking in a microphone, but everyone else nearby hears your voice normally. Additionally, if anyone outside the circle speaks to you, you hear them normally. There are no buildings or walls very close by that would naturally echo sound, so this phenomenon makes no sense. Adding to the mystery is a strange tower a few feet from the circle that shows dozens of little men and dozens of little hands and has no explanatory plaque. We stayed for only a few minutes but it was lots of fun and super weird and I am at a loss for anything more to say on the matter. We finally made our way to the drive-in, which caused lots of scheduling problems but was totally worth it. See, the movie can’t start until dark, which is at around 9 p.m. But Monday morning we were planning to go to the live cattle auction in Oklahoma City’s stockyards at 8 a.m. That meant sleeping in Oklahoma City, which is a two-hour drive from Tulsa. Which meant Sunday would be a very late night followed by a very early morning. 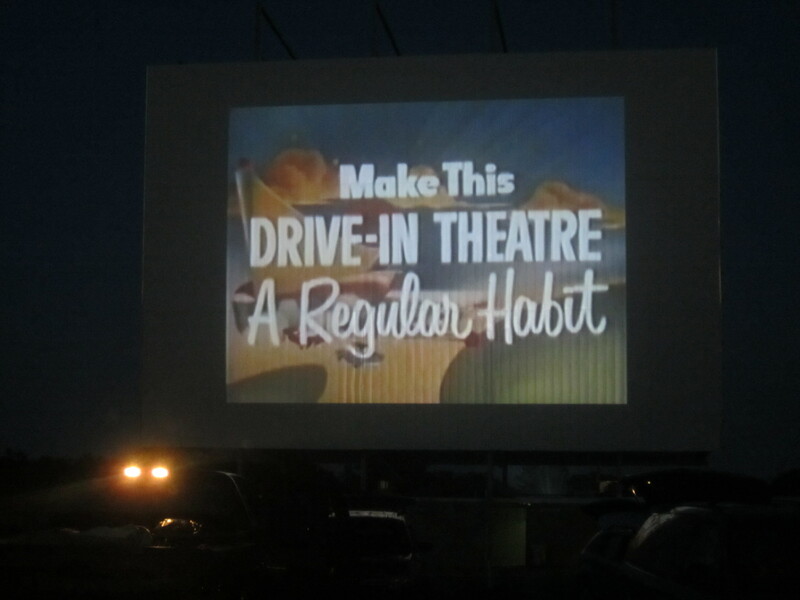 I toyed with the idea of skipping the movie, but I’d never been to a drive-in before, and I don’t know when I’ll have another opportunity, and Sam completely agreed. We saw the new Planes sequel. Ordinarily I would have no desire to see this movie, as the first one wasn’t very good and like any rational human being I try to avoid any movie that stars Dane Cook. 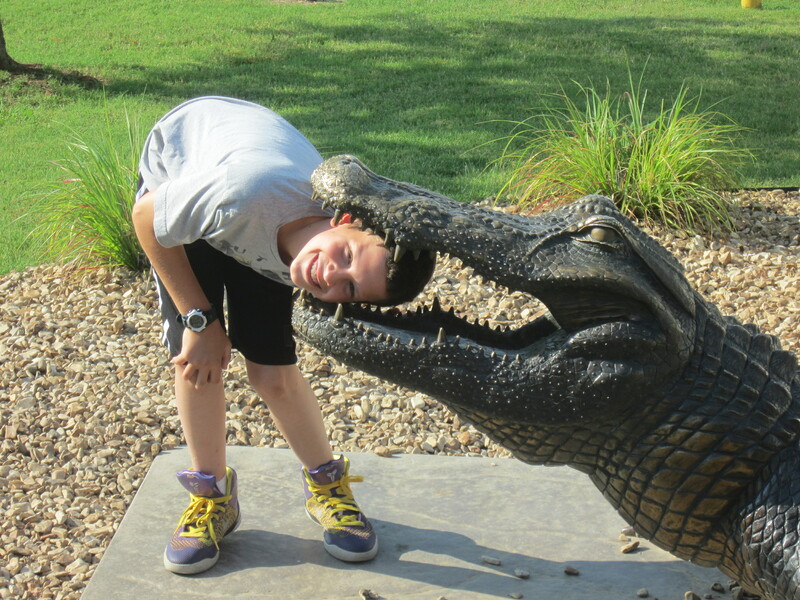 But I knew Sam would enjoy it, and I also knew it would mean a more family-oriented crowd, which would make the whole experience more comfortable. We ended up having a great time. The movie was mediocre, but it was super cool to park the car, put the top down, and watch from our seats with a gentle breeze keeping us cool. After fantastic weather for the past week (high 70s and sunny most of the time) July finally showed itself today with temperatures around 90 most of the day, so nightfall and the cooler temperatures it brought was especially enjoyable. The movie was mediocre, but Sam and I had a great time. At 10:30 we began the drive to Oklahoma City. 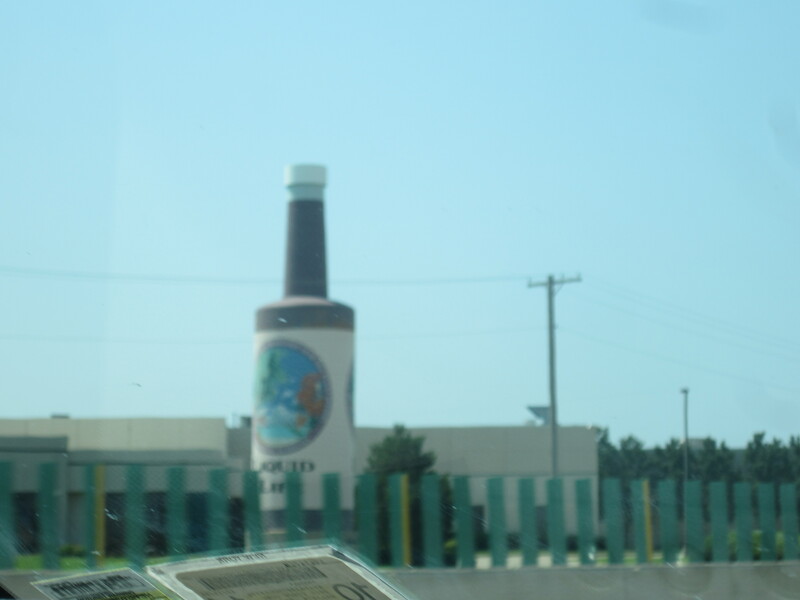 Sam fell asleep a little after 11, and by doing so he missed our final roadside sight of the day: a giant neon soda bottle right along Route 66. 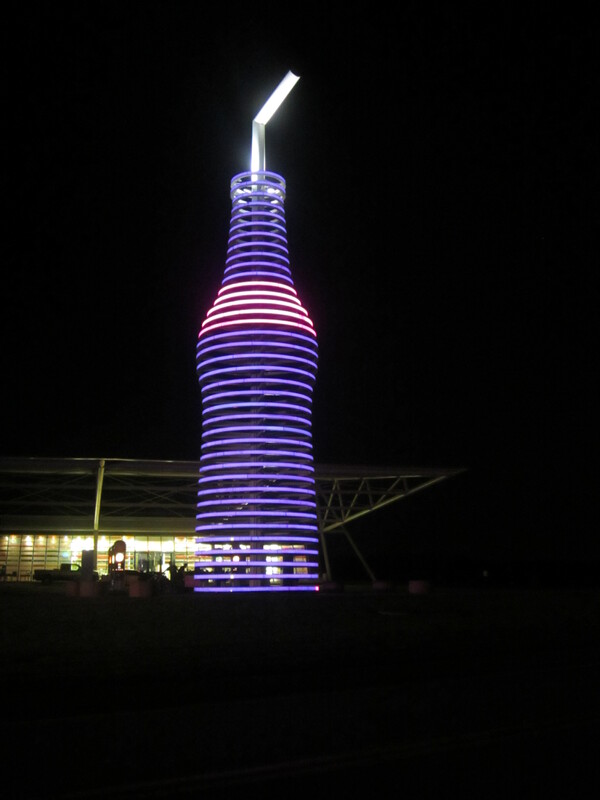 The bottle is—you guessed it—66 feet tall and lights up in color-changing rings. Nobody else was on the road, so I pulled over to snap a quick photo. While I was doing so, a police car passed by and, curious, turned around and followed me for a good 20 minutes before losing interest in me. Eventually we arrived at our motel, the third Super 8 we’ve stayed in thus far. I was pleasantly surprised by the first two. Not this one. But on the bright side, we won’t be here for long, as we’ve got a cattle auction to get to early in the morning.